Saint Francis of Assisi, “the little beggar” is perhaps the most popular saint in history. Francis was born in 1182 in Assisi, Italy and his baptismal name was John, but his father renamed him Franceso, in honor of his love for France. The son of a wealthy merchant, Francis had time and money to host lavish banquets for young nobles who proclaimed him “King of Feasts.” Parties and selling cloth left Francis little time for God. A handsome, charming and educated young man, he spent his early life leading young nobles to parties. He dreamed of knighthood and longed for the adventurous life of chivalry. In pursuit of that dream, he joined in the war between Assisi and Perugia at the age of 20. In that war, Francis fought with youthful enthusiasm, but was wounded and taken prisoner. Spending the next year in a dungeon, he contracted malaria. Ransomed by his father, a more reflective Francis returned to Assisi. Sickness overtook him and in that languishing experience he heard the first stirrings of a vocation to peace and justice. The military victories of Count Walter of Brienne revived Francis’ desire for knighthood. Under Brienne’s command, he hoped to win his favor and become a knight. On his way to join Brienne, Francis stopped in Spoleto and heard the shocking news of his death. Overcome by depression, his malaria returned. One night a mysterious voice asked him, “Who do you think can best reward you, the Master or the servant?” Francis Answered, “The Master.” The voice continued, “Why do you leave the Master for the servant?” Francis realized the servant was Count Walter. He left Spoleto convinced God had spoken to him. From that moment on, Francis began to care for the sick and the poor — especially the lepers — convinced that this was what God had called him to do. A further call came in 1205, when, in a dramatic moment of prayer in the abandoned Church of San Damiano, Francis heard a voice coming from the crucifix which challenged him to rebuild the church. At first he thought it meant that he should rebuild San Damiano, so he sold some of his father’s cloth to raise money to build the Church at San Damiano. His father, who was already upset about the life he was leading, took him to court, where was ordered him to pay back the money. Francis complied with a dramatic gesture, renouncing his inheritance and handing his expensive clothing to him as well. Dressed only in a workman’s smock, he left town and spent the next two years as a hermit, taking a vow of poverty and dedicating his life his life to God. Francis begged for his food, wore old clothes, and preached peace. 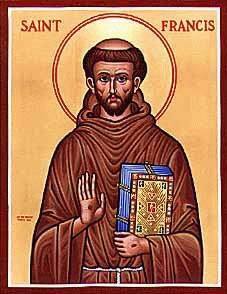 He began to attract followers, and in 1209 with the papal blessing he founded the Friars Minor (Franciscans). Then in 1212 with St. Clare of Assisi he founded the foundation of the Order of “Poor Ladies,” now known as the “Poor Clares.” He also founded the “Third Order of Penance” (the Third Order) which included lay people. He was the first person (recorded) to receive the stigmata (the five wounds of Christ) in 1224. Out of humility Francis never accepted the priesthood but remained a deacon all his life. He had a great love for animals. His ardent love of God merited him the name Seraphic. Francis died at the age of 44 on October 4, 1226 at Portiuncula, Italy. He was canonized by Pope Gregory IX less than two years later. But as for me, God forbid that I should glory, save in the Cross of our Lord Jesus Christ, through Whom the world is crucified to me, and I to the world. Ps 141:2 With a loud voice I cry out to the Lord; with a loud voice I beseech the Lord. v. Glory be to the Father and to the Son and to the Holy Ghost, as it was in the beginning, is now and ever shall be, world without end. Amen. O God, Who by the good works of blessed Francis enriched Your Church by establishing a new religious family, grant us to imitate him by emulation of him, by looking upon the things of earth as nought and ever to rejoice in sharing Your heavenly gifts. Through Jesus Christ, thy Son our Lord, Who liveth and reigneth with thee, in the unity of the Holy Ghost, ever one God, world without end. R. Amen. The mouth of the just man shall meditate wisdom, and his tongue shall speak judgment. V. The law of his God is in his heart; and his steps shall not be supplanted. Alleluia, alleluia. V. (Ecclus. 45: 9) The Lord loved him and adorned him: he clothed with a robe of glory. Alleluia. Make holy the gifts dedicated to You, O Lord, and by the intercession of blessed Francis, cleanse us from every stain of sin. Through Jesus Christ, thy Son our Lord, Who liveth and reigneth with thee, in the unity of the Holy Ghost, ever one God, world without end. R. Amen. May heavenly grace, we beseech You, O Lord, increase Your Church, which You mercifully enlightened by the glorious virtues and example of blessed Francis, Your Confessor. Through Jesus Christ, thy Son our Lord, Who liveth and reigneth with thee, in the unity of the Holy Ghost, ever one God, world without end. R. Amen.